Tales from a tribble: Happy Chanukah 2018! On this coming Sunday night, Dec. 2, 2018 at sunset will be the first night of Hanukkah or Chanukah, the Jewish Holiday called "the festival of lights" that will last for eight days until Monday, Dec. 10, 2018. 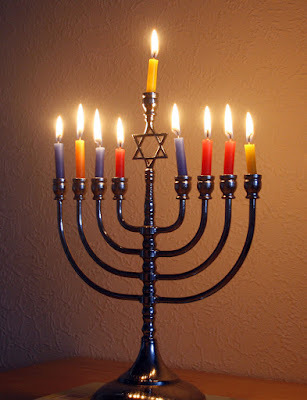 On the first night of Hanukkah one candle [plus the middle candle-"Shammes" that lights the other candles] will be lit on the "menorah". On each following night another candle will be lit until on Dec. 10, all eight candles [plus the shammes] will be lit. Hanukkah commemorates the rededication of the Holy Temple in Jerusalem by the Maccabees during which the "miracle" of only enough oil to last for one day lasted 8 days - thus the festival of lights lasting 8 days. This from the web site, Chabad: "In the second century BCE, the Holy Land was ruled by the Seleucids (Syrian-Greeks), who tried to force the people of Israel to accept Greek culture and beliefs instead of mitzvah observance and belief in G‑d. Against all odds, a small band of faithful Jews, led by Judah the Maccabee, defeated one of the mightiest armies on earth, drove the Greeks from the land, reclaimed the Holy Temple in Jerusalem and rededicated it to the service of G‑d." "When they sought to light the Temple's Menorah ... they found only a single cruse of olive oil that had escaped contamination by the Greeks. Miraculously, they lit the menorah and the one-day supply of oil lasted for eight days. ... To commemorate and publicize these miracles, the sages instituted the festival of Chanukah." Happy Chanukah To All And To All A Good Night. p.s., Don't forget to spin the dreidel. Chanukah celebrates the first victory for religious freedom! Light a candle forthose brave Maccabbees children. Thanks big Harry and Happy Chanukah to you and your family! Happy Chanukah, Michael, to you and Sheralyn! Loved the videos, especially the last one! Made me want to get up and dance! I'm still smiling!